Of all the flavors that Thanksgiving dinner brings, Mom's cornbread dressing is the one I look forward to the most. It's a southern dish taught by her great Aunt DeVerde & Auntie Carl from Ville Platte, LA. It has some of my favorite things in it which explains part of the appeal too me. 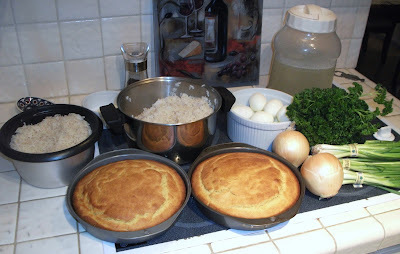 Cornbread, rice, parsley, eggs, onion, and turkey stock make up the base dish. However, the signature ingredient that gives this dish its real identity is the heart & soul of those that make it. It's a dish that takes a lot of time to prepare. Making dressing at the kitchen table, with family and friends the night before Thanksgiving is what truly makes the dressing special. 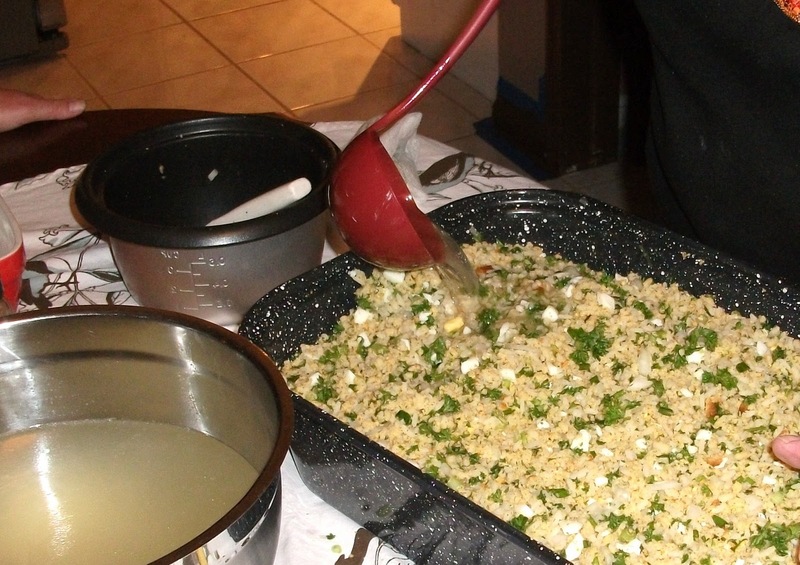 As a little girl, mom learned Big Momma's recipe known as "The Dressing" from her great Aunts. The sisters would drink some coke & moonshine and argue as to whether or not the right amount of rice, or parsley, or onion was mixed in. 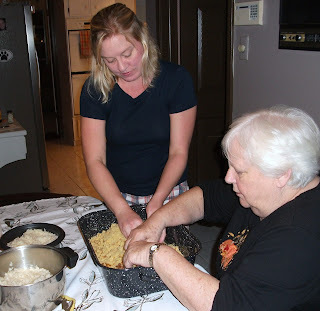 Two southern ladies razzing each other on cooking, parenting, and housekeeping skills. It was a kitchen filled with southern personality. By the evenings end and the smack talking over, the dressing was ready. I've made this dressing myself, but I didn't hit the same mark Mom does. It's one of those dishes that you just get your hands into and mix in a gigantic bowl. There is magic in that woman's hands, so this is where the difference must lie. This year, I demanded she ride down to my house and show me once again how to make this dressing. I have her over a barrel this go around because Michelle and I are making the Turkey. Then there is my secret weapon to get her to comply. Grand kids. Works like a charm. Turns out that what was missing when I made it before was the good company and conversation during the process, This year we hit the mark. There is a lot to do to make this wonderful southern soul dressing, so turn it into a fun evening. Get your crew involved and pour your favorite drinks. Enjoy the people and the process as much as the dish itself. This year we doubled this recipe out of fear of not having enough for leftover sandwiches. 1 large bunch curly leaf parsley - Do not even think about using flat leaf parsley. Start your turkey stock. Boil the turkey neck in water (about a gallon), 1 tbs of salt and 1 tsp pepper for about an hour. Bring water to a boil. Stir in rice, turn to low and cover. Simmer 20 minutes remove from heat and let sit covered. Preheat oven to 425. Mix and sift dry ingredients. Place Crisco into a 8" - 9" cake pan, put in oven to melt. While the Crisco is melting, mix into the dry ingredient the egg and milk. Once the Crisco is melted, swirl in pan to grease it, then pour the rest into the cornbread mix. Pour the mix into the greased pan and bake for 25 minutes. By now, there is a nice aroma filling the house, so have a drink while the rice and cornbread cools enough to handle. Gather up your help. They should be close by with all that aroma hanging out. You need a mixer, a fixer, a chopper, some advisers, and some story tellers. 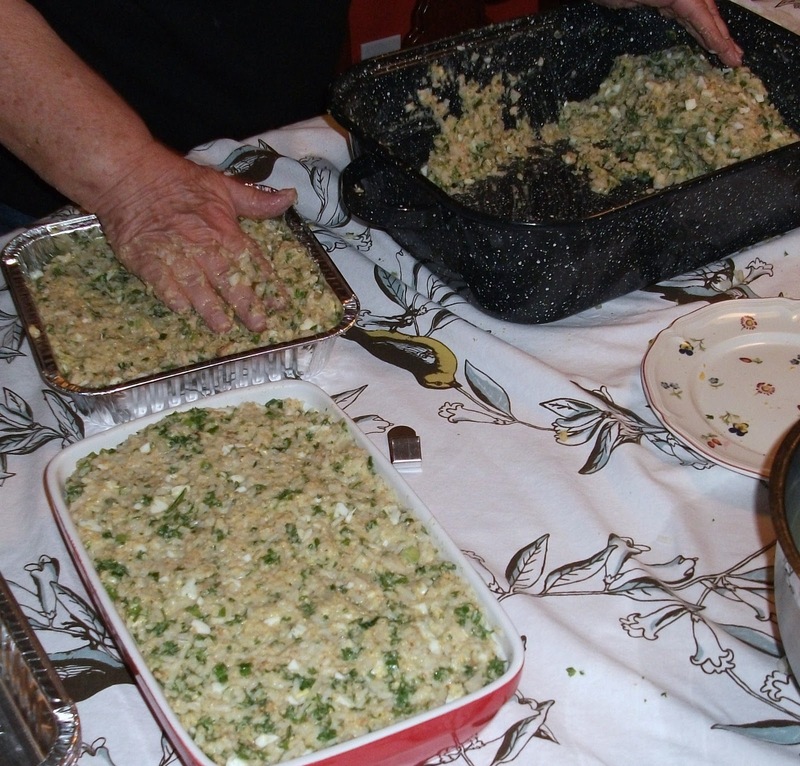 Break up all the cornbread into nifty little crumbles with your hands. Dump in the rice some at a time. This way you can debate the right blend with the advisory board. Dice up the eggs and mix in. Dice up the yellow onion and mix in. Dice up the green onion and mix in. Now we can start to debate to right amount of green color. Finely chop the parsley and mix in some at a time. Another great debating point. Parsley brings a whole lot of flavor, so its imperative that the story tellers and advisers come together in agreement on the balance. Mix well. Taste. Mix. Tell a story. Make it up if you have to. Pour in turkey stock a little at a time. Mix. Pour. Mix. You are looking for a moist consistency but not too wet. Its right when you can make a juicy ball that doesn't drip liquid. Advisers are quick to chime in during this final stage. 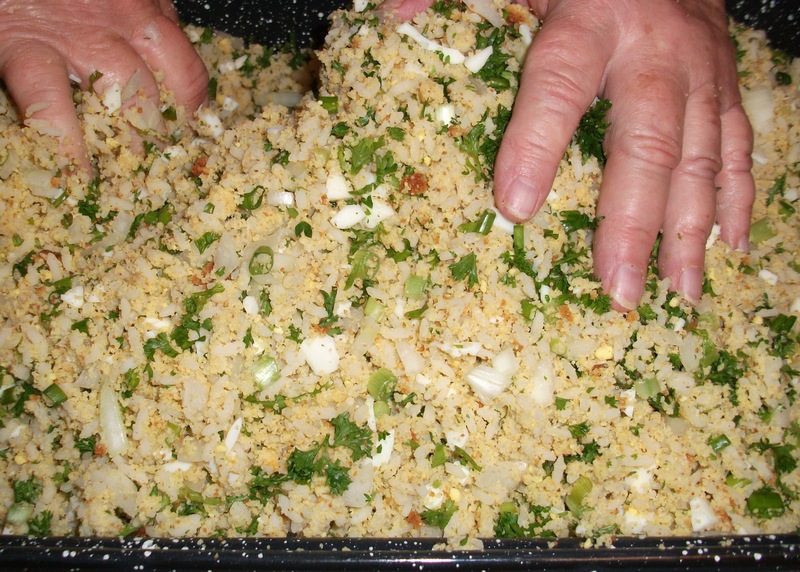 Place the dressing into a 3 Qt casserole dish. Let set over night in the fridge. You can certainly stuff your bird with the dressing if you like. It adds some cook time to the turkey, I like the bird stuffed with thyme, onion, and oranges better. But that's just me. Bake the dressing at 350 for about 45 minutes or until it gets a little crusty edge on top.